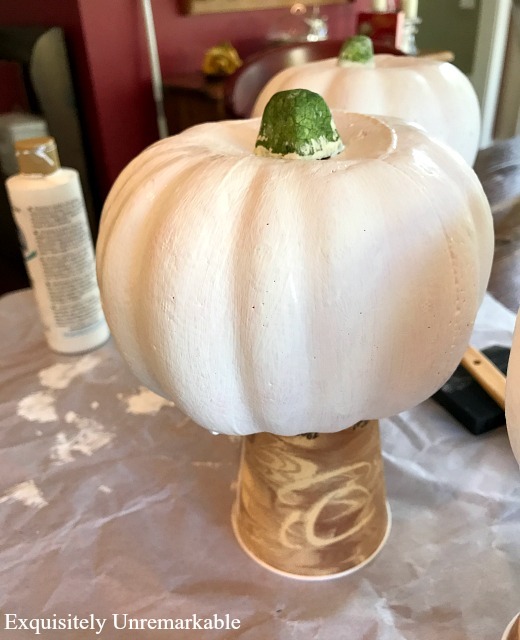 Turn those bright orange dollar store pumpkins into elegant additions to your fall decor with a little white paint and glitter glue. Several years ago, when I first started blogging, I noticed that once September rolled around, everyone started featuring the cutest little white pumpkins. Darling Baby Boos. I had never seen this variety before or come across them at any of the farms we went to ~ our pumpkins patches were strictly orange ~ but once I saw these elegant tinies in decor shots, I had to have them. After an exhaustive search, I finally found them at a local specialty nursery in my area, but each year they only had a few, I had to stalk the shop daily, since they flew our the door quickly and honestly, they were not cheap. 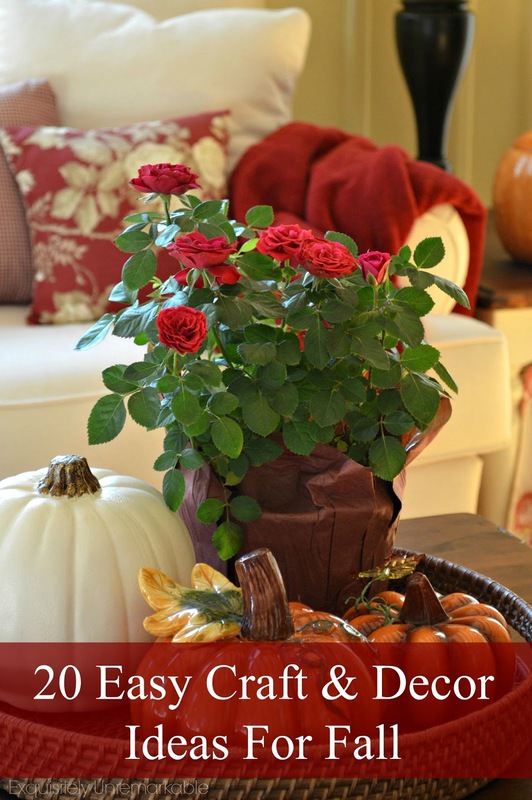 For a few years, they were the stars of my own fall decor. I adored their presence in my home, but honestly, this year, I just didn't have it in me to go hunting, fighting and spending. I've also grown a little bit bored with them. Shhh...that may be blasphemous to say out loud. It's also been very hot here, unseasonably warm. Real pumpkins are just beginning to turn up and and we haven't hit the farmsteads yet. So this year, I went faux. Gasp. I know, I know, another dirty little fall confession. Two in one post. Unbelievable. I'm not a big fan of fake anything, especially when it comes to fruit and flowers. 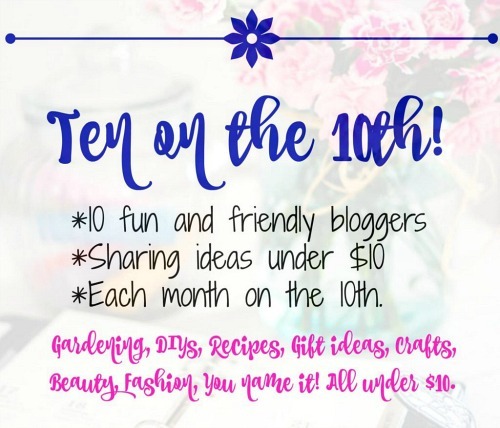 However, last month I was reading my friend Lisa's crafty painted pumpkin post for Ten On The Tenth ~ where ten bloggers, share something fabulous for less than ten dollars on the tenth of the month ~ and I was inspired. I ran to the dollar store and grabbed three orange, styrofoam suckers for a buck each and transformed them with a bit of paint and featured them in my fall tour. I was all set to share them with you today anyway, when I was asked to join those same ten talented ladies for Ten On The 10th. Imagine that. Meant to be, I think. I started with these very orange, very plastic, very loud and unnatural looking pumpkins. Not even a smidge of resemblance to my beloved Baby Boos. But they were only a dollar each. I wasn't quite sure if the styrofoam would take plain old craft paint, but it did. I used a bristle brush for the first two coats. Then I took a foam brush and dabbed it on to give the pumpkins a little bit of texture. I balanced them on cups so the wet paint wouldn't stick to paper. Three coats on three pumpkins sounds like a time consuming job, but it didn't take long at all. Craft paint dries fast. I was also completely engrossed in that fairytale show Once Upon A Time. Have you seen it? I hadn't and my daughter got me hooked on it. So I was enjoying myself episode binging and crafting. When all of the orange was completely covered, I took a bit of brown craft paint to cover the stems. I needed to seal the pumpkins and wanted to give them a bit of sparkle, but nothing too over the top, like my glittered pumpkins, so I sealed them all with a coat of white glitter glue. The result was subtle and elegant. And every bit as charming as their pricey predecessors. And for under ten bucks. I hope you stop by my thrifty friends and see what they have whipped up for less than $10 today. 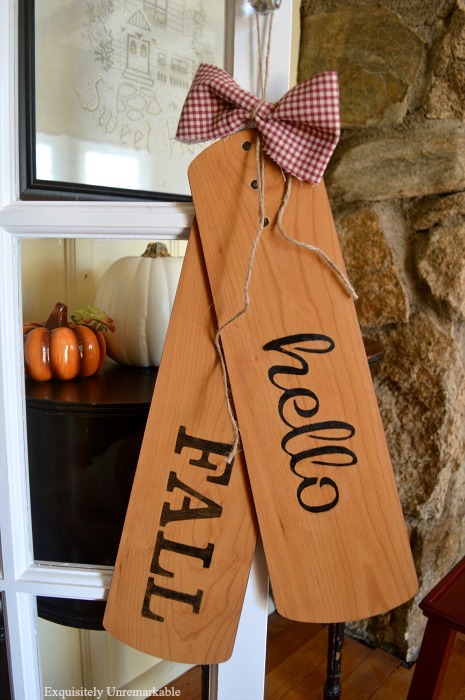 And...if you're looking for even more fall pumpkin ideas you can check out AllFreeHolidayCrafts.com for tons of ideas. 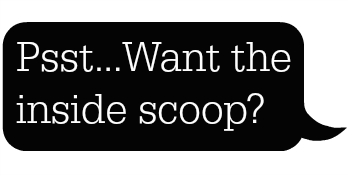 Be sure to check out my profile there for any crafts you might have missed here. Fabulous indeed! The world is better with a little sparkle and sparkling a pumpkin is a great idea! Happy Ten on the 10th sweet friend. I was a little unsure when I took the brush to them, too...styrofoam is tricky! Thanks for inviting me to play along. So much fun! And the really great part is that when you pull out your fall decor next year, those little cuties will be ready to go again! They are perfect. 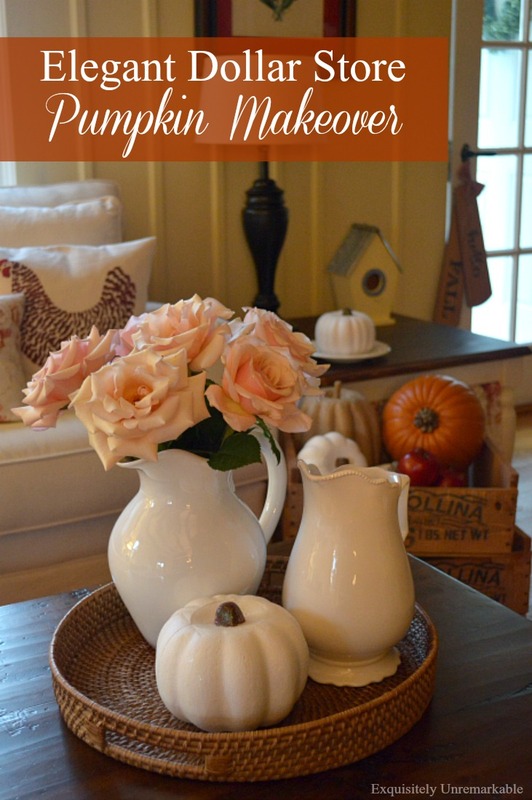 I love white pumpkins, too, and this is a cute and not too difficult craft! :D I like that you painted the stems, too. Very cute and white is the perfect color for your vignette with the white pitchers. Thank you so much and yes, I am with you, neutrals rule lately! Still no pumpkins here...pricey and too hot. Maybe when they go on sale! Ha!! Great idea and very cheap! I won't get around to any of this this year. Maybe next year. Always love projects under $10! Thanks Brenda...and yes, you seem to have your hands full with a much bigger painting project! Kim, I'm so glad you joined us this month. I passed on that style at my local Dollar Tree only because I already had a few too many pumpkins in my basket. I love the way yours turned out. I do not think it is blasphemous to say you are bored with the white pumpkins. The best part about going faux is you don't have to hunt new ones down next year! Thanks so much for the inspiration, Lisa. I didn't have any chalk paint and was hoping that craft paint would do the job...and it did! Never would've tried it if it wasn't for your post! And so happy to be joining in...fun, fun, fun..times ten! Perfect Kim. Now you can have these year to year and not have to hunt and spend to get the baby boo's. I have to say I am a fan of Faux flowers and fruits. They are making these things so life like now. I am thinking about going faux in my flower boxes out front instead of real pumpkins. Of course the squirrels will not be happy with this choice!! Have a great rest of the week. Thanks Kris! I really do adore them, but the hunt is a drag. You are right about the squirrels, too, little devils eat everything I put out. I used to love faux flowers and fruits, but then the dust factor scared me away. I am starting to add a few faux accents back in again slowly...and make my kids dust!! Ha!! Very cute! I love the touch of sparkle...gearing up for some snow soon? We usually have snow by Halloween. And I love the way you staged your pumpkin, I'm a bit of a junkie for white pitchers. Haha...No snow, Audra. Summer girl here, remember? 😉 I know it's coming, but for right now I am hoping that these glittery pumpkins are the only sparkle we get until Christmas Eve! If only... and thanks! I love how they came out...what a difference from the rather ugly orange they started out as! Thanks so much, Debbie…and yes, they were very bright before! Thanks for the visit! There is nothing more satisfying than transforming something inexpensive into something wonderful. You did such a good job .You have the gift. Thanks so much, Laura, I had fun with this one, super easy, big change. Thanks for the visit, have a wonderful weekend! I love your pretty white pumpkins that you painted Kim! I do like the way a white pumpkin looks and love that it was so easy to paint! How fun to have participated with the group of bloggers too. They are a super nice group, Julie and I am honored to have been asked! I've never bought baby boos...just admired from the sidelines, so it' OK for you to say you're bored. I think everything runs its course when you see so much of them from year to year. Those Dollar store pumpkins do look too orange, but of course, I bought one anyway. Now I'm glad to know what to do with one when I'm bored with orange. Choices are always good, Florence! Enjoy your pumpkin! I love the baby boos pumpkins and buy then every year at our Farmers Market. Your elegant dollar store pumpkins turned out so nice! Baby boos seem to rot quicker maybe because they are smaller. Last year I started knitting pumkins and this year I made a few baby boos. Nice thing about them they don't rot. I just realized I hadn't seen a post from you in a while so I came to hunt you down. THEN, I realized that you had fallen off my sidebar when I redid the stupid thing. You are back on there, baby, and good to go. Can't get away from me no matter how hard you try! Love your faux baby boos- I really like the brown stems on them, too....good choice. I have three of those orange dollar store pumpkins. I bought mine last year, as I wanted to do a faux mercury glass craft with them. Never found the right paint in my area. This year I did but I didn't want to pay $11 for a small can of paint, so in my basement they sit. This is a cute idea, and less expensive. Win-Win! I like it. 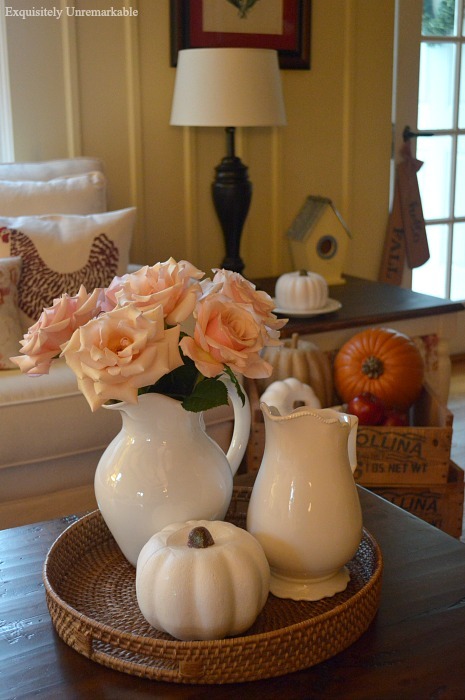 At first when I saw white pumpkins on blog land I was not sure what to think. Now I love the idea and would like to have some myself. Great idea to paint them. I had never seen them before I entered blogland, Betty, then I couldn't get enough...I am having fun with my painted ones this year. They were fun to make. Those are adorable, Kim! I wish I didn't have to rely so heavily on faux everything, but real pumpkins have a difficult time in this climate. I've been seeing some very unusual real ones at our Sprouts store and also Trader Joe's, so I may cave and buy a couple. I totally understand, Carol, it's been so warm here, lately, which is very unusual. I can't imagine pumpkins lasting very long in the heat...but yes, there are some very pretty ones out there! Warm hugs to you my friend! They look great ! It has been quite warm here as well...85 degrees yesterday. While a few folks in the neighborhood have some pumpkins and mums out the real show is still people's flowers and bushes! I just can't put pumpkins out when it's 85, Deb...nope. Thanks Judy! It was fun to go faux this year. I've been having fun moving them all around! To cute Kim! I just LOVE your new look pumpkins!! Your roses are just stunning! Thanks so much, Sam...and both were super cheap! A little paint can do wonders Kim! :) They turned out so cute. A touch of white paint and a little bit of glitter and you got a dazzling pumpkin that just looks lovely in your kitchen! Love those white pitchers, so pretty! A very fun and easy afternoon project! Super easy, Marilyn, and thanks! And since I hardly ever watch tv, this was a fun and different way to spend the afternoon! Such a cute makeover, Kim! I'm kinda wishing I went with faux pumpkins too. The white pumpkins I purchased are already beginning to rot! It's hard to find white pumpkins of any kind here, except at Safeway and they are way too expensive. 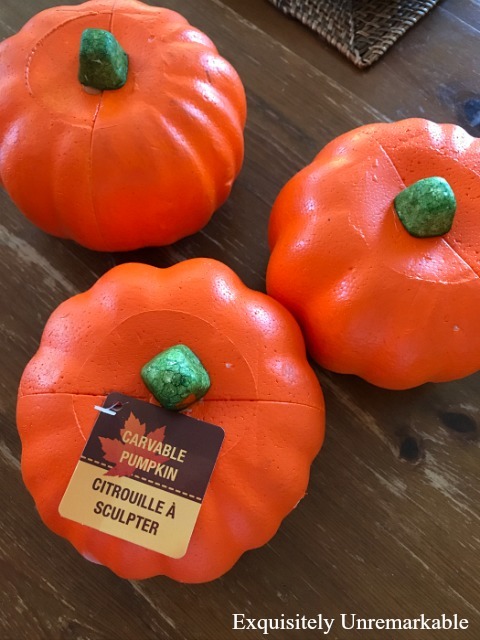 Clever crafters like you have done some incredible things with faux pumpkins, and that makes the thought of using faux pumpkins more appealing. The only issue for me is storage, although tiny pumpkins would certainly be easier to stow away. Hugs. They are very expensive here, too, Nancy and they rot quickly...especially since it's still so warm here, lately. And yes, I have the storage issue, too. However, since I purged over the last few years, I have enough room for three tinies. But I need to stop at those three! 😉 Hugs to you, my friend! 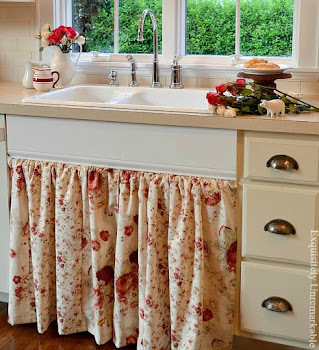 Once again, you've done it, my friend - simple, elegant, and even a non crafter like me could pull this one off!!! Totally…it was fun to do while binging on Netflix, too! And thanks! TV binging and crafting sounds like a perfect combo! I love your white pumpkins. I've spray painted some in the past too. I'm telling ya...paint can fix anything. Lol! Paint is amazing, Lisa, I agree…and I am usually not a binger, but this show has me hooked! Another amazing idea from Kim. Thank you friend. You sure could have fooled me, Kim. I thought it was the real thing in the first picture. And now they're yours forever. Alas, with no storage for seasonal decor here in our house now, except for Christmas things, I'll stick to the real ones. And luckily they are easy to find at our Nashville Farmers Market and only 2 for $1. And I guess I'd miss the experience of going on my annual pumpkin buying trip. But if I had a free shelf to put them on I would certainly want some of your cuties, especially with a little glitter. How fun is that! Like others at first I wasn't too sure of white pumpkins ... but they are brilliant! Thanks so much, Jan! Now there are so many varieties, next year I may paint some green! Kim I was stupid enough to try and paint those little suckers with milk paint. At first they look like the paint would slide off but once it dried it actually stayed on. Whew! Great price and for a bit of paint they look fantastic!